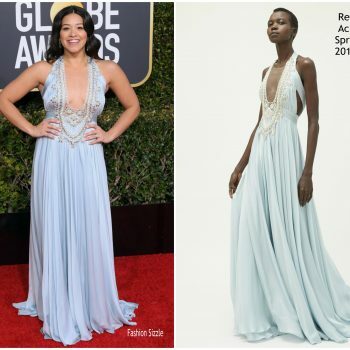 Gina Rodriguez attended the 2019 Golden Globe Awards on Sunday (January 6) in Beverly Hills, California. 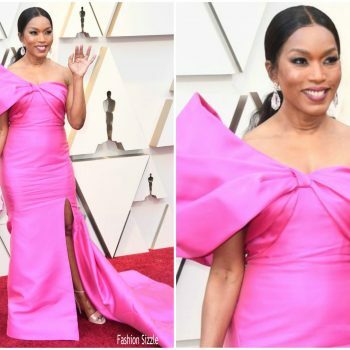 She wore a baby blue Reem Acra Spring 2019 gown styled with Chopard jewelry. 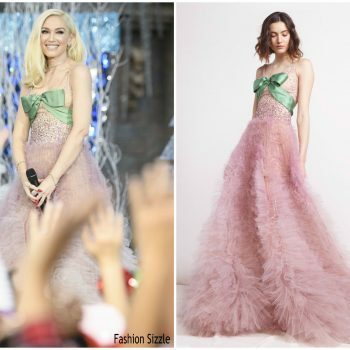 Singer Gwen Stefani celebrated the holiday season at Disneyland where she performed for the annual Disney Christmas Parade wearing a ReemAcra Pre-Fall 2018 embellished pink tulle gown with a green satin bow. Jenna Dewan arrives at the The 2018 Baby2Baby Gala Presented By Paul Mitchell Event at 3LABS on November 10, 2018 in Culver City, California. 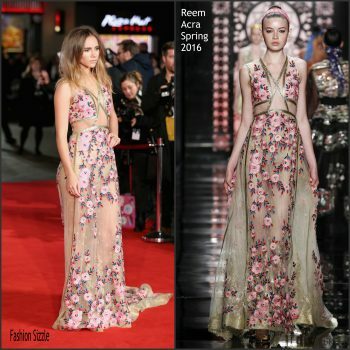 She is wearing a Reem Acra outfit. 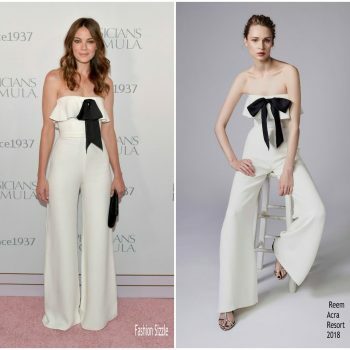 Leslie Mann attendedthe amfAR Gala Los Angeles 2018 on Thursday (October 18) in Beverly Hills, California. 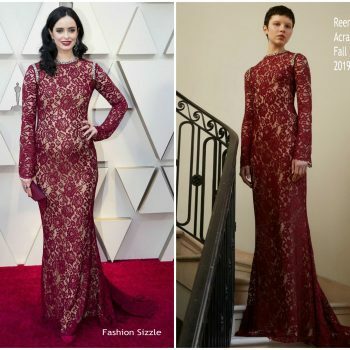 She wore a Reem Acra Resort 2019. 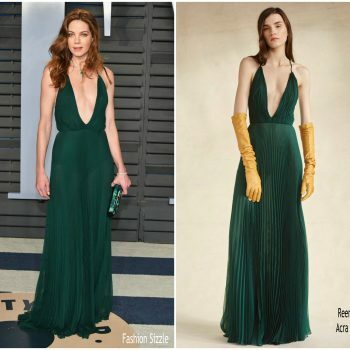 Sydney Sweeney was in attendance at the 2018 Emmy Awards. 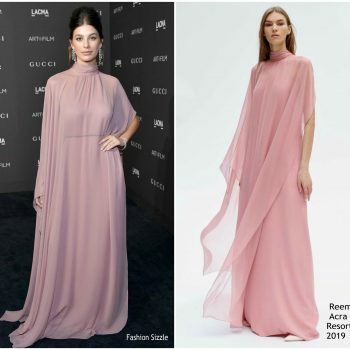 She wore a pink Reem Acra Pre-Fall 2018 lace gown. 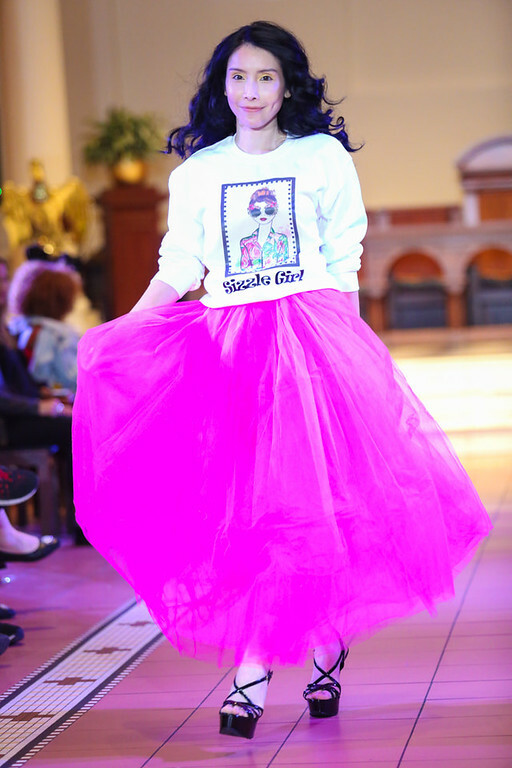 Awkwafina attended the premiere of ‘Crazy Rich Asians’ on Tuesday (August 7). 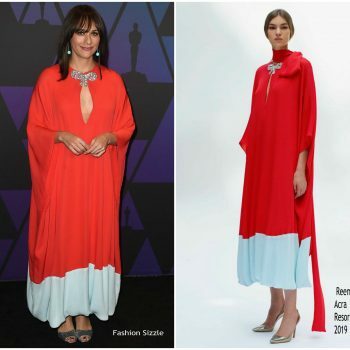 She wore Reem Acra Pre-Fall 2018 styled with a pair of Giuseppe Zanotti ‘Betty’ heels and a Le Vian diamond and ruby ring. 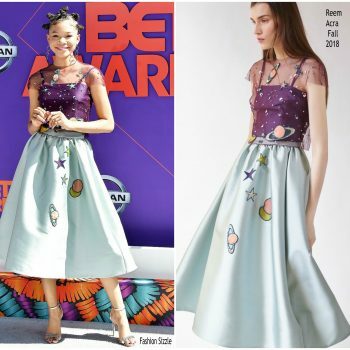 Storm Reid attend the 2018 BET Awards at Microsoft Theater on June 24, 2018 in Los Angeles, California. 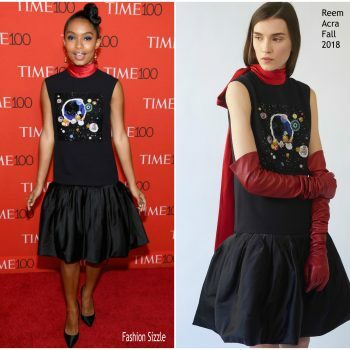 She wore a Reem Acra Fall 2018 star and planet embellished top and skirt. 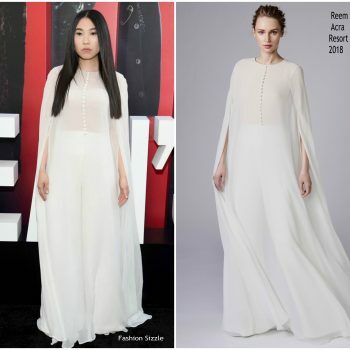 Awkwafina attended the ‘Ocean’s 8’ world premiere in New York City last night (June 6) She wore a white Reem Acra Resort 2018 gown . Karen Gillan was in attendance at the ‘Jumanji: Welcome To The Jungle’ LA premiere on Monday on December 11, 2017 in Hollywood, California. 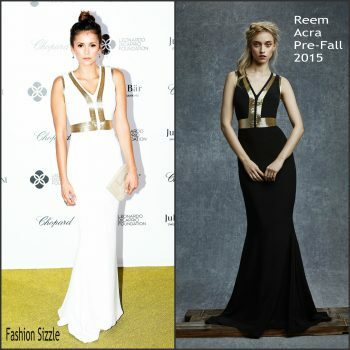 She is wearing a gold halter Reem Acra gown. 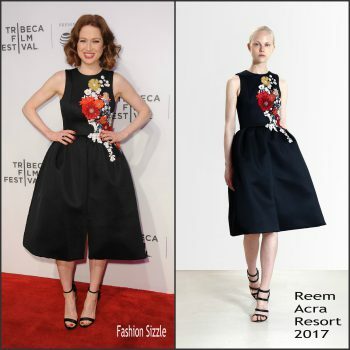 Ellie Kemper was in attendance at the premiere of ‘Unbreakable Kimmy Schmidt’ during the Tribeca Film Festival in New York. 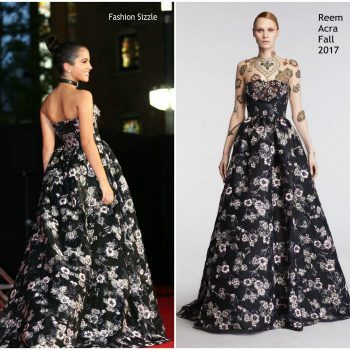 She wore a sleeveless black floral embroidered Reem Acra Resort 2017 dress styled with black heels. Angela Sarafyan was in attendance at ‘The Promise’ on Wednesday (April 12) in Hollywood, California. 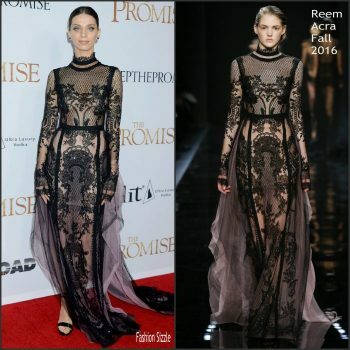 She black lace Reem Acra Fall 2016 gown. 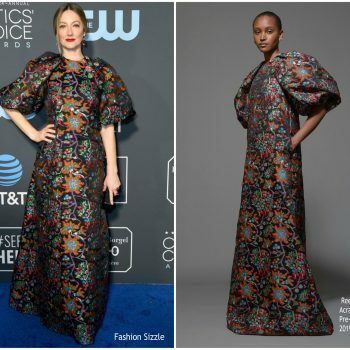 Gwen Stefani was in attendance at the 2017 People’s Choice Awards in Los Angeles, USA – 18 Jan 2017 She wore a Reem Acra Spring 2017 blue 2-piece outfit. Fan Bingbing attends the De Beers flagship store opening on Madison Avenue on Wednesday, Dec. 7, 2016, in New York. 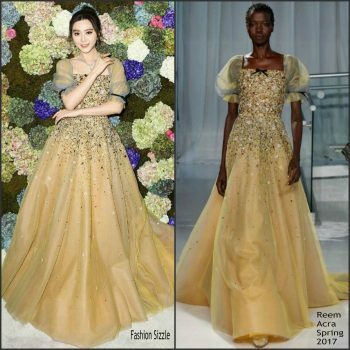 She wore a yellow Reem Acra Spring 2017 embellished gown. 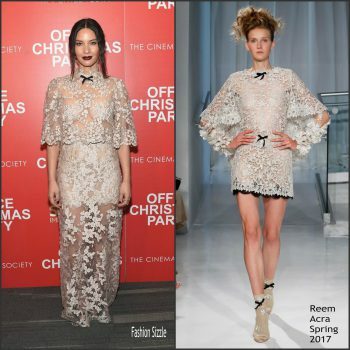 Olivia Munn was in attendance at the office Christmas party screening in New York on December 5, 2016. 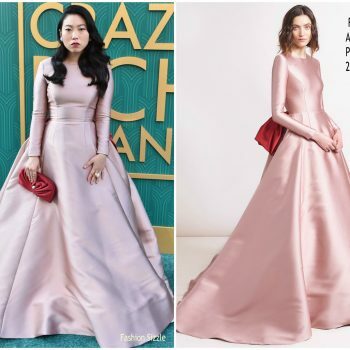 She wore a blush Reem Acra Spring 2017 b lace capelet gown. 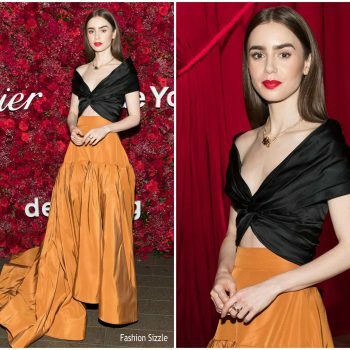 Actress Lily Collins attends Santa Barbara International Film Festival's Kirk Douglas Awards Honoring Warren Beatty at Bacara Resort on December 1, 2016 in Goleta, California. 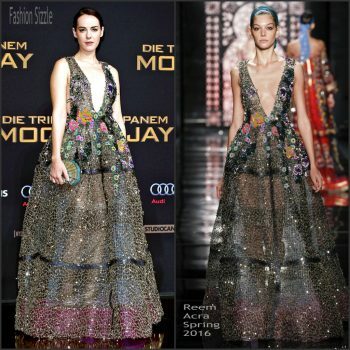 She wore a Reem Acra Fall 2016 dress . 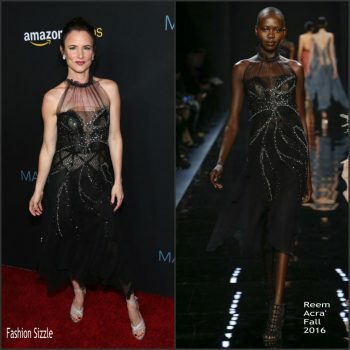 Juliette Lewis attend the premiere of Amazon Studios' 'Manchester By The Sea' on November 14, 2016 in Beverly Hills, California. 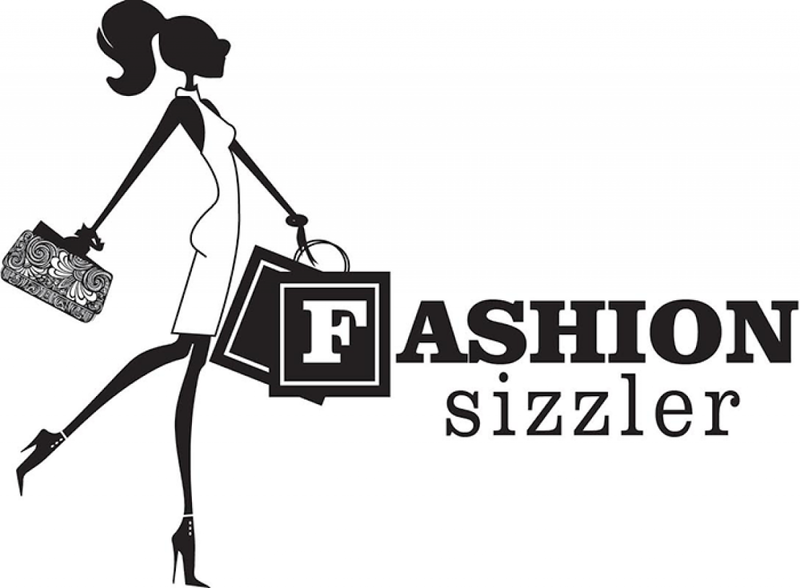 She wore a black Reem Acra Fall 2016 embellished sheer halter dress. Freida Pinto attends Glamour Women Of The Year 2016 at NeueHouse Hollywood on November 14, 2016 in Los Angeles, California. 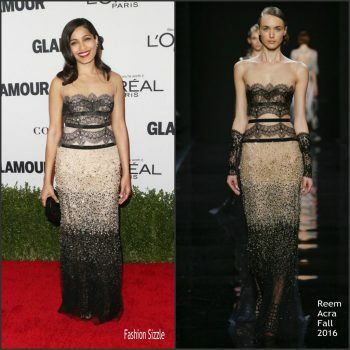 She wore a Reem Acra Fall 2016 lace gown. 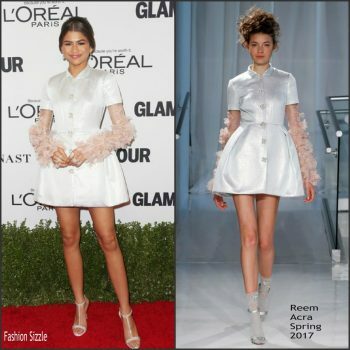 Zendaya attends Glamour Women Of The Year 2016 at NeueHouse Hollywood on November 14, 2016 in Los Angeles, California .She wore a white Reem Acra Spring 2017 flared mini dress that has embroidered sleeves. 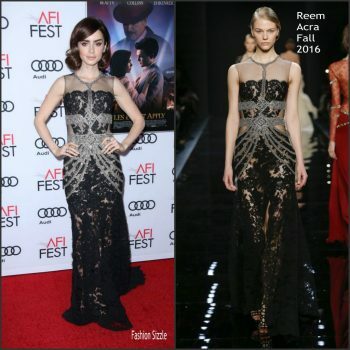 Lily Collins was in attendance at the 2016 AFIFest Rules Dont Apply Premiere She wore a Reem Acra Fall 2016 black lace gown with embellished detailing. Jennifer Morrison attended the Entertainment Weekly 2016 San Diego Comic Con party at the Hard Rock Hotel on Saturday(July 23rd) in San Diego, CA. Honoree Britney Spears attends the 2016 Billboard Music Awards at T-Mobile Arena on May 22, 2016 in Las Vegas, Nevada. 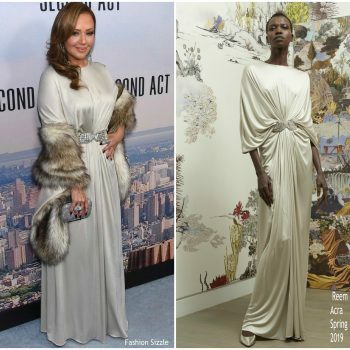 Sarah Jessica Parker was in attendance yesterday at The New 42nd Street's 25th Anniversary Gala in New York. Leslie Mann attended the European Premiere of ‘How To Be Single’ at Vue West End on February 9, 2016 in London, England. 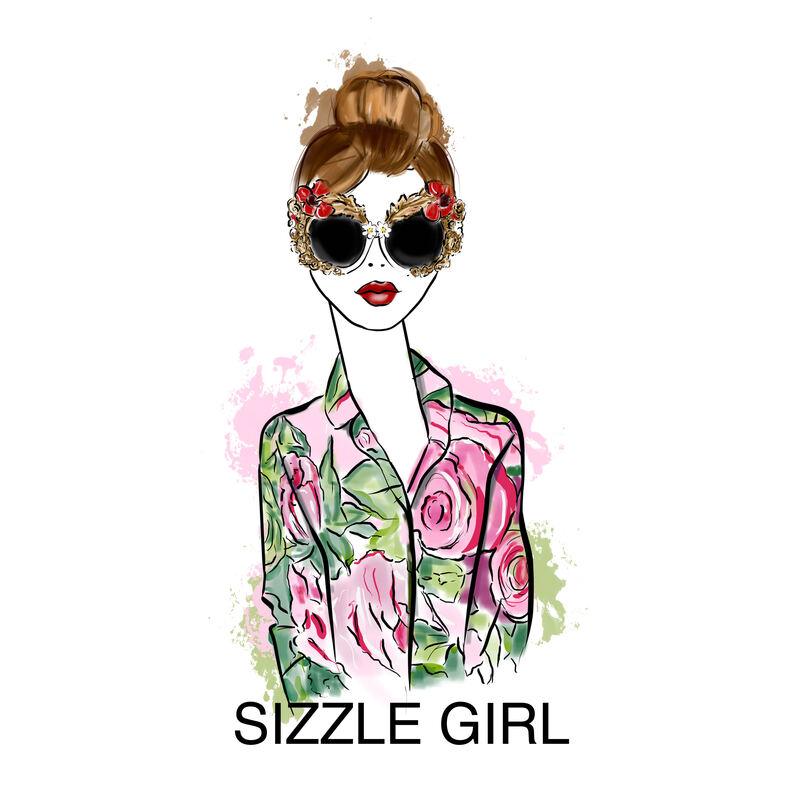 She is wearing a short sleeve black Reem Acra floral-embroidered lace dress . 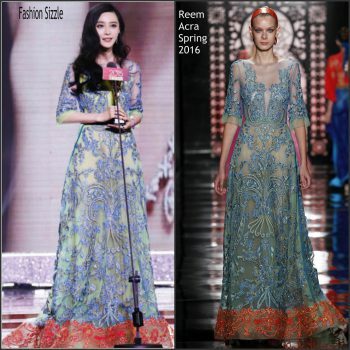 Fan Bingbing was in attendance and accepted her 'Best Actress' award at the 2015 Anhui Drama Awards on December 2,.2015. 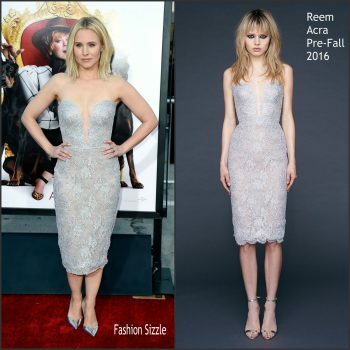 The actress wore a three-quarter sleeve Reem Acra Spring 2016 gown .